This post contains the handout of the lab I gave on Zero Touch Nodes in C# at the Dynamo User Group Computational Design Workshop in Sydney on the 2nd of December 2017 . You can find source files on GitHub. This workshop will teach you how to set your graph free by developing custom Dynamo nodes using the Zero Touch approach. 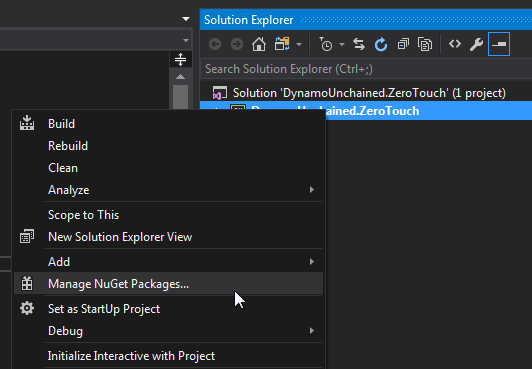 It will go thorough the different types on nodes and their advantages, then it will teach you how to configure Visual Studio for development and debug. Finally, using simple examples, it will teach you how to build your own nodes. After this workshop you will be able to add new features, improve workflows and contribute to the Dynamo community. The workshop will be using Visual Studio and C#, for information on getting started with C# please see the links in the Additional Resources section. 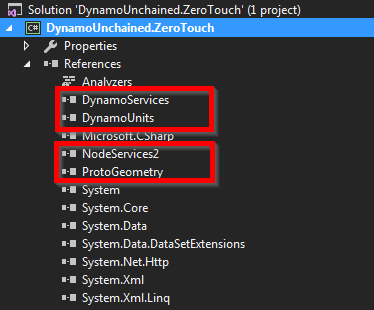 In Dynamo it is possible to add custom functionalities using special components, these are called custom nodes. They can be really useful for frequently used routines or for adding completely new and advanced features. 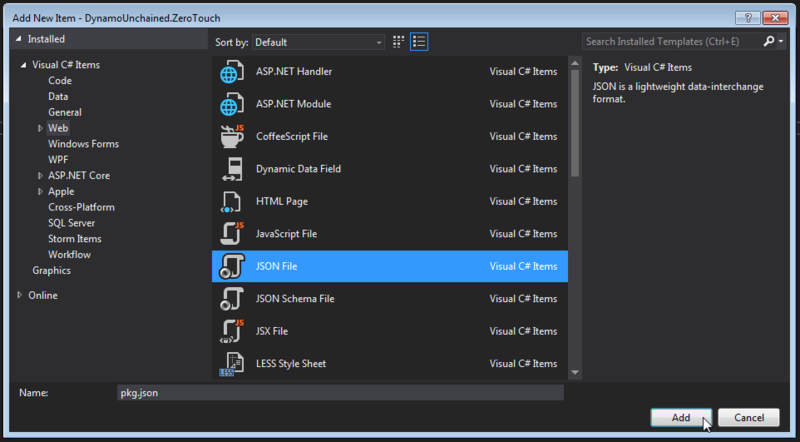 A Zero Touch Node (ZTN), is a custom node written in C#. A ZTN can be obtained by simply importing a DLL inside of Dynamo, all the public static methods will automatically appear as Dynamo nodes. By writing your own ZTN you will benefit of the .NET framework, a solid IDE, debugging tools and lots of libraries, C# nodes are also sometimes more performant than Python ones. This type of node needs to be compiled into a DLL every time you want to make a change, this means your code is more safe if you are gong to distribute it but for small tasks Python nodes might still be a better solution. Visual Studio Community 2017 (VS) is going to be our IDE, it’s free and fully-featured for students, open-source and individual developers. In this part we are going to create a new project, add references and packages and all necessary files. It’s very important to set up the project correctly, it will take some time and it might look confusing at first but it will facilitate development and debugging, and so make you a better developer. Please note that this is how I personally set up the environment, there are of course many other ways to do it. At the end of this part you’ll have generated an empty boilerplate project which you can reuse in the future, you can find a the final files of this part inside the “DynamoUnchained.ZeroTouch - part 1” folder. Latest versions of Revit (2017/2018) use .NET Framework 4.6 (4.6.1 or 4.6.2), if you are targeting a version prior 2017 change it accordingly. I used DynamoUnchained.ZeroTouch as Project Name and DynamoUnchained as Solution Name (a solution can contain multiple projects). To extend Dynamo at a very basic level (eg. 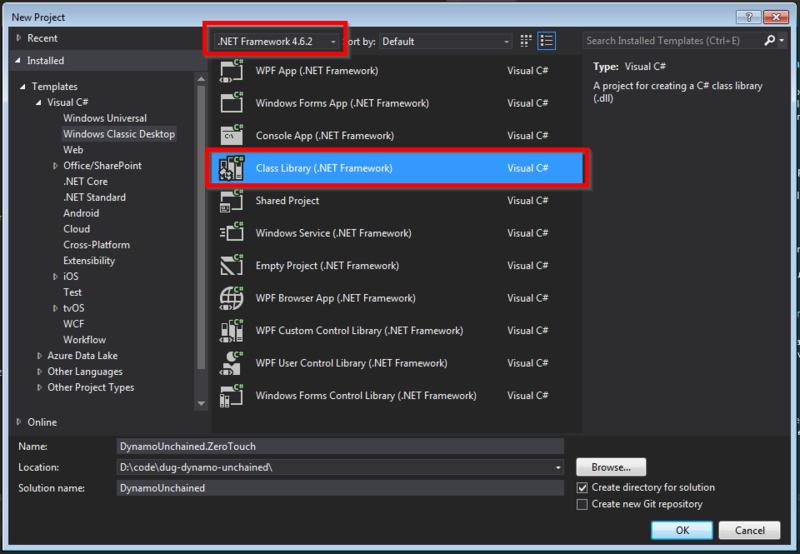 manipulating native .NET data types as strings, numbers…) you don’t need to add any reference. But to interact with its geometry types we need to add a few. We’ll be using NuGet, as it makes referencing super easy and it lets you build your node even without Dynamo or Revit installed. For now we need DynamoVisualProgramming.ZeroTouchLibrary which depends on DynamoVisualProgramming.DynamoServices and will be downloaded automatically. Make sure they match your Dynamo version. This will avoid unnecessary files in our package. 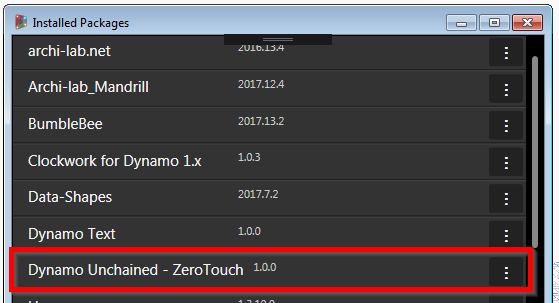 A zero touch node needs to be loaded by Dynamo manually each time or be added as a package. We’ll set it up as a Local Package, so that it will automatically load every time Dynamo starts. It will also make our life easier in case we decide to publish the packed in the future. Let’s finally configure the project so that the files are copied automatically into the Dynamo packages folder after each build in order to Debug our dlls. xcopy /Y "$(TargetDir)*. *" "$(AppData)\Dynamo\Dynamo Core\1.3\packages\$(ProjectName)\bin\"
xcopy /Y "$(ProjectDir)pkg.json" "$(AppData)\Dynamo\Dynamo Core\1.3\packages\$(ProjectName)"
These lines tell VS to copy the dlls we produce in the bin folder, and the pkg.json into the package folder. xcopy /Y "$(TargetDir)*. *" "$(AppData)\Dynamo\Dynamo Revit\1.3\packages\$(ProjectName)\bin\"
xcopy /Y "$(ProjectDir)pkg.json" "$(AppData)\Dynamo\Dynamo Revit\1.3\packages\$(ProjectName)"
Note: The path above points to the current version of Dynamo Sandbox, if you’re using a different version edit accordingly. We are using Sandbox because it’s simpler and faster than Dynamo for Revit. Also note: The start action is a user specific setting, not a project setting, you will have to set it again every time the project is cloned. Before going ahead to debug our code, we need to change a VS setting. This is not required by Dynamo, but Revit instead, we’ll do it now for peace of mind. Go under Tools > Options… > Debugging > General > Check “Use Managed Compatibility Mode”. If Managed Compatibility Mode is unchecked and you try debugging within Revit it will crash during startup. Now, if you put some breakpoints in VS you’ll be able to get great insights of what’s going on in your code, this will help you fix bugs quicker and improve your dev skills too! One last thing, annoyingly enough, Dynamo didn’t format the Node Name very well. Our node was nested inside DynamoUnchained > ZeroTouch > DynamoUnchained > ZeroTouch. The first two are taken from the assembly name (the DLL), the last two from the namespace, which in our case are the same. I prefer to keep my assembly names unchanged, so let’s add the XML file to the root of our project, then remember to select it and set its Build Action to Copy always. We’ve now finally set up our project correctly, you can save the project and use it in the future as a template. 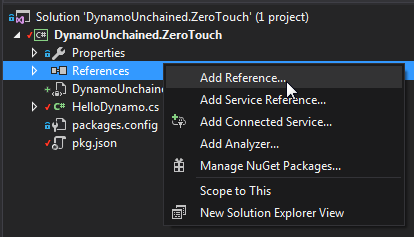 In case you missed some steps you can find the complete project inside the “DynamoUnchained.ZeroTouch - part 1” folder. In this part we will develop a few sample nodes exploring inputs, outputs and Dynamo’s geometry. 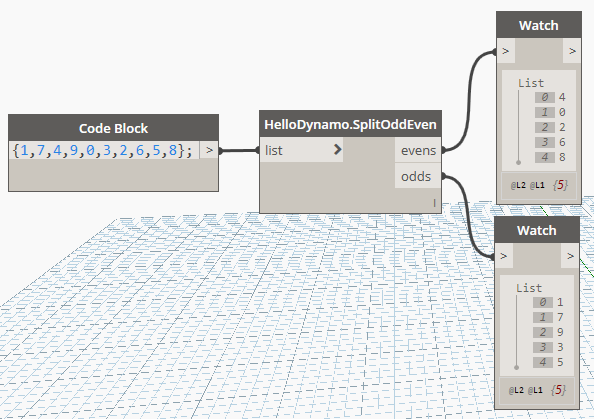 Since we wont’t be interacting with Revit just yet, development will target Dynamo Sandbox. As mentioned previously, each public static method that you have in your project will show up as a node in Dynamo. Let’s now see how to add more complex functionalities. Most of your nodes will take one or more inputs, do something with them, and then return one or more outputs. As you can clearly understand, the above will only accepts the declared input types, to accept any type you can use the object type. For lists/arrays, again, just follow normal C# conventions. item //Add item to the end of cloned list. Everything covered so far will run smoothly in Dynamo Sandbox and it’s great to use it to get started developing nodes, but soon enough you’ll want to be interacting with Revit elements too. A great thing of zero touch nodes is that they’ll let you use the Revit and Dynamo API at the same time, this might be a bit confusing but we’ll see soon how to do that, the revitapidocs website is great to get familiar with the Revit API. The Revit elements you access inside of Dynamo are not the native ones, but are wrappers around them, we’ll also see more in detail what this means. We need to add 3 more references manually, as these don’t come as NuGet packages. Again, remember to select these newly added references and to set Copy Local to False. As mentioned earlier, since now we’ll be building and debugging for Revit, you now need to update your start action and build events. This isn’t too exciting, but hey, you wrote your first ZTN for Revit! The code also shows us how to unwrap a Dynamo wall to get the native Revit one, and how to convert a Revit curve into a Dynamo one, a fundamental part of zero touch nodes. The following lists show some of the most common extension methods that you might need, they take care of conversion of Revit elements and geometry to Dynamo ones and vice-versa. We’re now going to do something more complex, we will write a custom node that takes in a string, converts the text shape into lines and uses those lines to place walls. We don’t need to get into detail, this class simply converts a string text into lines, note the [IsVisibleInDynamoLibrary(false)] attribute that prevents it from showing up in Dynamo. For it to work you need to add a reference to System.Drawing in References > Add Reference… > Assemblies > Framework. Now, you’d be very tempted to write something like the loop below, using the Dynamo API for generating new walls, but beware! Because of an intrinsic mechanism called element binding (that can’t be turned off), the loop would only return a single element. The right way to loop and generate multiple elements is using the Revit API. Whenever you are using the Revit API to create or modify elements, these methods need to be wrapped inside a transaction. This is handled automatically when calling Dynamo methods.